Multirotor Pelican lets the farmer disperse up to 8 liters of chemicals per flight. Its 6 spray nozzles disperse, combined, 1 L/min on a 4-5 m width. 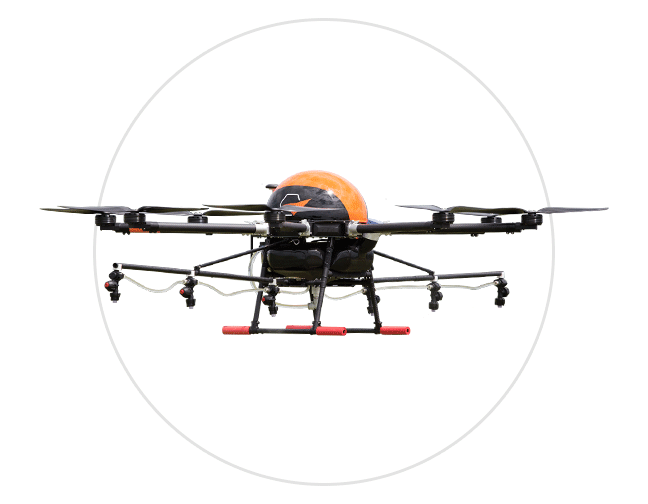 Added to this, its highly accurate pre-programmed flight allows automated spraying only on real-need spots, being ideal to small crops and timely adjustments to precision agriculture. Application: precision agriculture and public health, controlling the Aedes aegypti mosquito. Compact and foldable, can be transported on a truck or van. Carbon fiber structure and eletric start. 6 spray nozzles, forming drops of 180 µm. Dispersion of 1 L/min (0,1666 L/min per nozzle). Sprays up to 1 hectare flight. and 5-10 ha per day. Up to 8 liters or 10 kg of liquid payload. 1-3 m flight height above plantation. Maximum take-off weight is 25 kg. Click on the button and download the brochure.